Delivered Cheyenne 3/1/44; Kearney 12/1/44; Romulus 24/1/44; Grenier 29/1/44; Assigned 323BS/91BG [OR-R] Bassingbourn 24/2/44; 140m Returned to the USA 1321 BU Bradley 11/6/45; 4168 Base Unit, South Plains, Texas 18/6/45; Reconstruction Finance Corporation (sold for scrap metal in USA) Kingman 7/12/45. NINE O NINE. 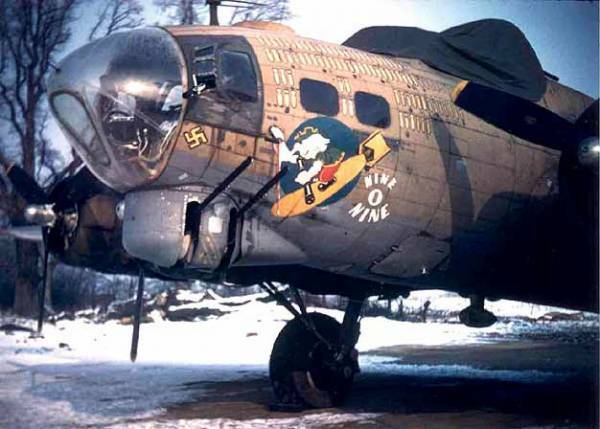 Die Original B-17G #42-31909 ‚Nine-O-Nine‘. Flog 140 Einsätze.